After earning career victory No. 1,000 in Saturday's Grade III Fred W. Hooper Stakes at Gulfstream Park with 6-year-old gelding Aztec Sense, trainer Jorge Navarro was quick to emphasize the teamwork behind his ongoing success. “I give thanks for my owners and my staff, because without them I probably would be sitting at 1 (victory),” said Navarro, who has won nine in a row with Aztec Sense. “My assistants make things so easy for me. All I do is make sure everything goes as straight as a line, but they're the ones who do everything. Navarro sits atop the Gulfstream Park standings with 26 victories, but with 101 Thoroughbreds in training (the majority at Palm Meadows Training Center in Boynton Beach and Gulfstream Park West in Miami Gardens), he needs another outlet at which to compete. 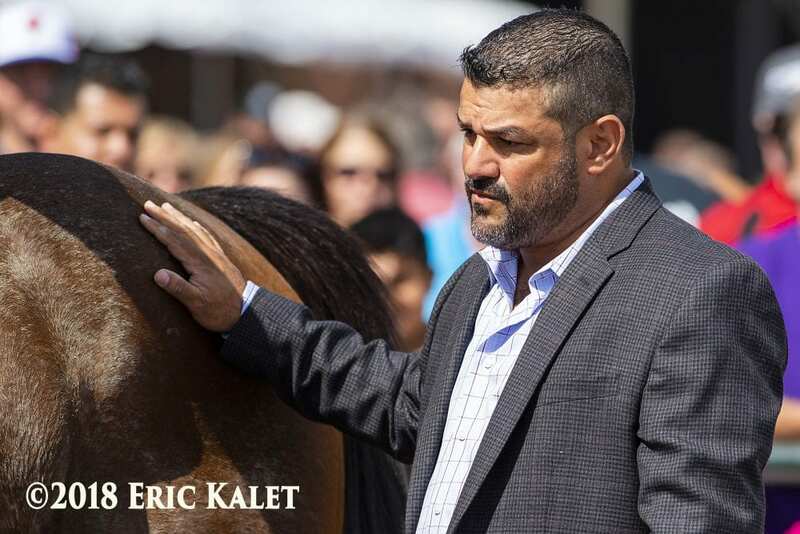 He eagerly snapped up stalls at Tampa Bay Downs this season, putting assistant Hendrick Chen in charge of a dozen horses. “I like action, and I have plenty of owners who like action. I run a big operation, and if a race doesn't go at Gulfstream, they're willing to move their horses around to give them a chance to win a race,” he said. The results have been impressive for the Navarro operation, which last had horses stabled here six years ago and currently has 12 on the grounds. Under the supervision of assistant Hendrick Chen, Navarro has sent out eight winners from 30 starters. The Navarro stable turned red-hot in Oldsmar in January, sending out seven winners and three runners-up from 16 starters. The sizzling performance earned Navarro the Rumba Island Bar & Grill Trainer of the Month Award. Navarro has seen numerous horses thrive when shipped to Tampa Bay Downs to compete on its sand-based oval, notably his outstanding 7-year-old Florida-bred sprinter X Y Jet. The multiple-Grade III stakes winner won the 6-furlong Pelican Stakes here last season by seven lengths in a dazzling 1:09.17, then finished second by a head in his next start to Mind Your Biscuits in the Dubai Golden Shaheen Sponsored by Gulf News at Meydan Racecourse in the United Arab Emirates. Navarro has trained three Grade 1 winners: 2015 Priority One Jets Forego Stakes winner Private Zone, 2017 Alfred G. Vanderbilt Handicap winner El Deal and 2017 Cigar Mile Handicap Presented by NYRA Bets winner Sharp Azteca. Some of his other standouts included graded-stakes winners War Story, Catalina Red and Delta Bluesman. There are times when Navarro has to pinch himself to be sure his dream is real. “I've been on the backside of a racetrack since I was 13, starting out as a hot walker, and I've had great trainers around me to help teach me what to do and what not to do,” said the Panama City, Panama product, who set a Monmouth Park record last year by saddling 85 winners. For all the outstanding horses that grab the headlines, there are scores of others that provide their own share of thrills. Such was the case on Jan. 12, when a Navarro-trained first-time starter named First Deal won a $16,000 maiden claiming race here by nine lengths in an impressive 1:10.72 for 6 furlongs. This entry was posted in NL List, People and tagged Florida horse racing, jorge navarro, tampa bay downs by Press Release. Bookmark the permalink.